LAKE MARY, Fla., Feb. 19, 2019 /PRNewswire/ -- FARO® (NASDAQ: FARO), the world's most trusted source for 3D measurement and imaging solutions for 3D design announces immediate availability of FARO RevEngTM. 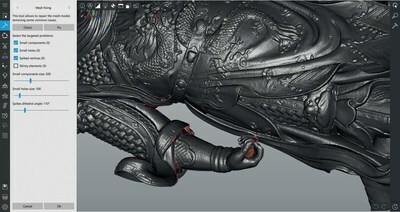 This advanced software platform provides FARO Design ScanArm and FARO 8-Axis FaroArm® system users with a powerful tool that enables a comprehensive digital design experience (https://www.faro.com/reveng). RevEngTM addresses a variety of reverse engineering and design challenges across a range of industries including Automotive Aftermarket, Research & Development, Heritage Preservation, Industrial Machinery, Engineering Services and Computer Graphics. FARO RevEng Software provides users with a single solution to capture color point clouds and edit mesh quickly and efficiently. Create the ideal 3D model with the Undo/Redo feature that allows users to navigate easily between previous editing steps with no risk of losing high-quality data. 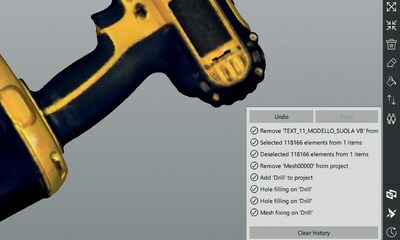 Put the final touch on the mesh model using the quick check and fix selection tool for refinement. Simply select and extract curves from a mesh using the easy to find icon tools. RevEngTM tools and functionality are tightly integrated to assure a seamless handoff of project information, which dramatically streamlines end-to-end workflows. For design professionals who need to capture high quality color point cloud scans to generate high quality mesh models, RevEngTM displays a clear, true to life color representation of the source items. As a result, users have absolute confidence that exceptionally high-quality information can be edited in RevEngTM or exported to 3rd party software for editing and final model generation. 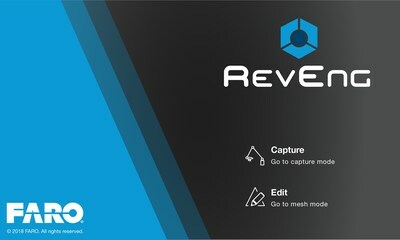 For users who need to refine mesh models and extract sketch geometry for 3D design activities or 3D printing, RevEngTM delivers a full set of tools to edit and optimize the mesh model. This enables production of the most accurate and efficient digital representation of the scanned object possible. Final output can be a watertight mesh model, mesh shell optimized for 3D printing, or a collection of 2D and 3D curves to feed into the CAD modeling stage of the design workflow. Additionally, RevEngTM includes advanced algorithms that significantly reduce processing time. "As a solutions-driven enterprise, FARO is focused on our customers' optimizing their investment," stated Thorsten Brecht, Senior Director, 3D Design. "FARO RevEngTM is modeled with this as the core development sensibility. We appreciate that time to market and design flexibility are critical to the success of any design project."